On Your Mark, Get Set, Blast Off! If you happen to travel nearby the Kennedy Space Center on December 1st, there is a good chance you will encounter aliens and other intergalactic creatures. Well, maybe not real aliens, but definitely people running dressed in alien costumes. This is the day the 2013 Columbia Space Coast Marathon & Half Marathon is scheduled to launch. The 2013 Columbia marathon will mark the marathon’s 42nd year of existence. Did you know that the Space Coast Marathon is the oldest marathon in Florida? It is true. It is also allegedly one of the most entertaining to participate in. Who doesn’t enjoy the thrill of dressing up in their favorite Star Wars attire? 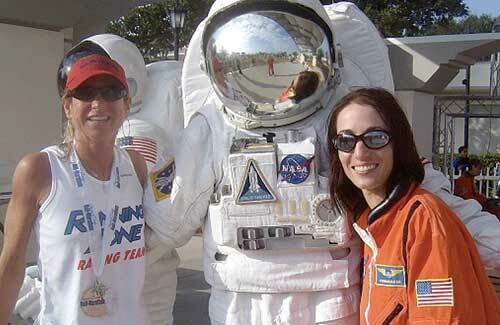 The marathon adopted a space theme tradition because of its close proximity to the famous Kennedy Space Center. The marathon race begins in the historic center of Cocoa Village and circles around the Riverfront Park. Family, friends, and visitors alike can all cheer on participants and watch the race unfold on the Jumbo-tron at the Riverfront Park amphitheater. For those participants that complete the marathon three times, are rewarded with the Milky Way Finisher medal and the veterans that complete the marathon five times receive the ultimate honor. They get the Intergalactic Challenge Finisher Medal. These medals are highly sought after badges of success. The Space Coast Marathon and Half Marathon race is hosted this year by the Running Zone Foundation located on 3696 N. Wickham Rd in Melbourne. The Running Zone Foundation is a foundation created in 2008 by Don and Denise Piercy to promote fitness and health within the Melbourne community. Don and Denise Piercy own and operate the Running Zone Store which specializes in selling running and walking shoes. At the Running Zone, finding the correct shoe for each individual is taken very seriously. The Running Zone staff consults with each customer to find out the customer’s individual fitness level and goals. Past injuries and surgeries are discussed. Customers are also treated to a free gait analysis, which involves studying foot arches and ankles. Once analysis is complete, the customer is presented with several running/walking shoes to best meet their needs. The Piercy’s passion for fitness within their community has extended beyond their store to their now hosting the annual Space Coast Marathon and Half Marathon. To them it is not about catering to the diehard running fanatics, but more helping each individual become more fit and healthy. If in town the week after Thanksgiving, stop by their store for expert shoe advice and check out the extraterrestrial runners over at the Riverfront Park. The Space Coast Marathon is sure to be an event the whole family will enjoy.